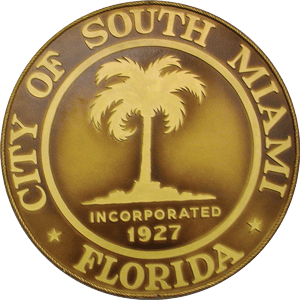 On June 25, 1927, W. A. Forster was sworn in as South Miami’s first Mayor, and the City began its nine decade journey. In this fifth installment of our history series, we focus on the more recent developments over the past thirty-plus years. 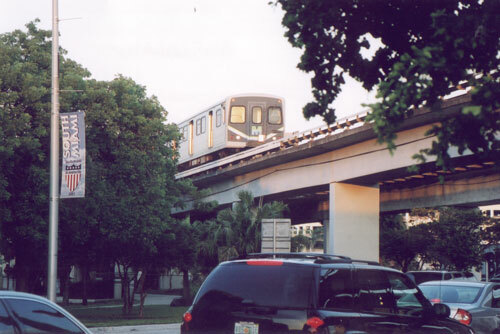 May 20, 1983 marked the opening of the South Miami Metrorail Station. This elevated railway, designed to provide public transportation and alleviate vehicular traffic, imposed itself in the eyes and ears of those who lived along its route. The railway, a gray concrete overhead intrusion in the Florida sky, with its station and parking garage in an architectural style justly known as “Brutalism,” were sited opposite the entrance to our town center’s restaurant and retail district. The train’s wheels which could have been rubber were instead rendered in steel. In the interest of saving costs, those along the route have ever since been treated to the grinding and gnashing of steel-on-steel as the trains squeal to a stop in the station. Important to the city’s future prosperity, the opening of the Metrorail station was greeted with a marketing campaign created to bring attention to this small city just south of Coral Gables. Because the Metrorail tracks mostly followed the old FEC Railway, the campaign built on the theme: “Always a Railroad Town.” A calliope played and city officials donned railroad engineer’s caps. 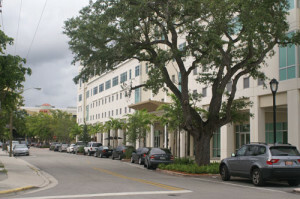 South Miami was the only station on the route that had a viable downtown/commercial area in its proximity. At $866 million, Metrorail was the largest public works construction project in Dade County’s history at that time. 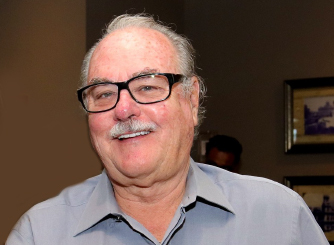 The presence of the Metrorail in South Miami helped to spawn dreams, charrettes, and the multi-million dollar Bakery Centre that met with utter failure. In an effort to address the city’s future planning direction, a community charrette was convened in November 1992. An overlay ordinance designed to govern future development within the study area was adopted by the city commission the following year. The Hometown Plan Area 1 was completed by Dover, Kohl & Partners in January 1993. 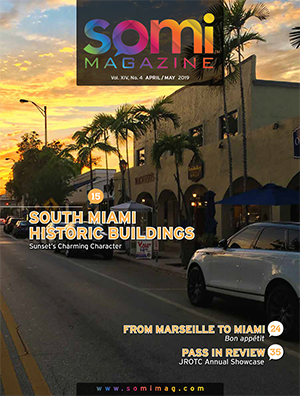 It envisioned a future for South Miami’s downtown that strove to keep traditional small town design values with people-friendly, pedestrian-oriented public spaces. The study area indeed created a hometown and not an ultra-urban downtown. Narrow sidewalks and wide streets were modified to encourage slower through-traffic and wider landscaped sidewalks were created to attract people to the area, encouraging al fresco dining. 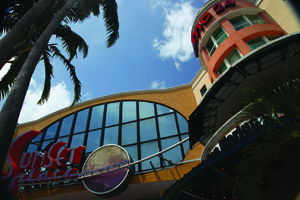 The Shops at Sunset Place. 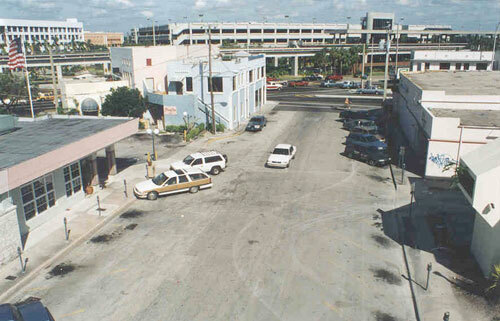 A second charrette was conducted in 1994 to address the neighborhood west of US1. Hometown Plan Area 2, also developed by Dover, Kohl & Partners, proposed a renewed, sustainable community of strong traditional neighborhoods that could be the envy of the region. It included many of the recommendations and goals from the first charrette. 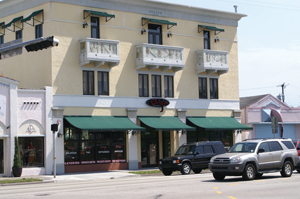 The subsequent master plan included transit-oriented development, protection for historic structures and pedestrian improvements to the streets and commercial buildings. South Miami Hometown Station artist rendering. Hometown Station was to be a live-work project envisioned for siting on the Metrorail site that entailed wrapping the station’s parking garage with four story liner buildings and capping the garage with a courtyard and apartment building. The development was to make the Metrorail site a more welcoming, viable, and functioning public space–one which would connect to its surroundings and the community. In 1999 the Board of County Commissioners awarded a lease for the project to Raul P. Masvidal’s Hometown Station, Ltd. The lease began in 2001 and work commenced on Phase I which was the refurbishment of the existing garage; three other phases were planned. In 2005-6, clearing of the site for Phase II office building. 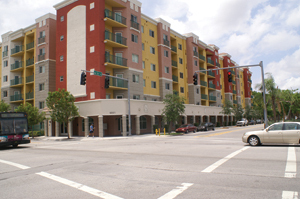 Phase III had ground retail space; and an apartment building in Phase IV. 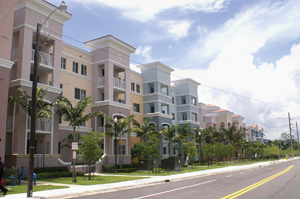 In 2002-3, the Miami-Dade Housing Authority chose the site for its new $27 million, 157,000-square-foot office complex; Mr. Masvidal’s company was awarded the lease agreement. Much controversy ensued concerning the MDHA’s proposed building, including the initial $5 million funding for the project, and continuing with an outcry over a stripped-down redesign by Arquitectonica that some leaders felt eliminated much of the charm of the original Dover-Kohl concept. Delays, site infrastructure issues and changes were alleged by both Miami-Dade County and Hometown Station, Ltd., which resulted in the county’s cancellation of the entire project and ongoing legal hurdles for Raul Masvidal. As the battle over Hometown Station was waged and ultimately lost, our residents and visitors were left with a barren plot of county-owned land surrounded by Jersey barriers and green construction fencing. Eight long years later, the city was able to carve out 17,000 square feet for a passive park through a $1 per annum lease agreement with the county. Paciencia Park, named after John Henry’s sculpture, “Paciencia.” was formally opened on November 24, 2009. 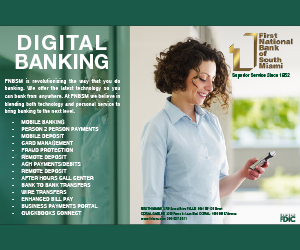 Fast forward to 2017 (although “fast” is a misnomer with government related projects), the 7.7 acre site is now being developed by the Treo Group, a privately held real estate investment firm. Plans call for a state-of-the-art Class A office building with 99 student housing units included in the project, ground level shops and restaurants, which will complement the SOMI town center’s live-work-play-learn environment. GUEST COMMENTARY BY VICTOR DOVER, FAICP, town planner and urban designer with Dover, Kohl & Partners. The Sunset Drive makeover took place a generation ago. The internet was still a young, little-known idea then. At the time, our downtown was one of only a couple of pleasant, walkable commercial districts in the whole region, and had almost no competition. (Back then, Lincoln Road was still a lonely, windswept nowhere!) Now SOMI’s main street has predictably begun to decline again, as its finishes are aging, tastes have grown more sophisticated, deferred maintenance needs have accumulated, and implementation of the plan has slowed. The confidence in perpetual progress, once high, may be waning. Red Road never got its badly needed makeover. There’s still no high-quality hotel, and only a few dozen residents in the centre of town. Most importantly, retailing downtown is now under a competitive siege. On one hand, numerous other walkable mixed-use places have cropped up or revived since the 1990s, and on the other hand, internet shopping is dramatically changing how Americans buy things. Sales have declined. For the first time in decades, vacancies have even returned to Sunset Drive. It’s time to refresh the Hometown Plan, envision a new generation of revitalization, rededicate ourselves to perpetually improving our streets and public spaces, and get going on the unrealized parts of the vision.